Servicing your Ford at D&J Ford is the best way to protect its value. A full Ford service history can help you to achieve stronger resale value, and the professional services that you receive will give you confidence and peace of mind. 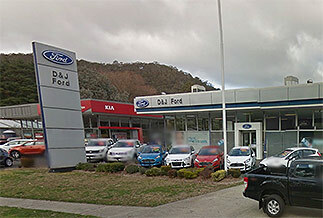 Booking a service at D&J Ford is easy, simply complete the online booking form on the right, or call our Service Centre on (02) 6352-2644. Please allow a minimum of 2 Business days for your Booking. Available at participating dealers on scheduled services or overnight warranty repairs. Private and Blue, Silver and Gold Business Fleet customers only. Advanced booking may be required to ensure availability. Fuel costs, tolls, fines and late return fees may be payable by the Customer. Excess may be payable in the event of damage. Seewww.ford.com.au/service/t-and-c for full terms. Available to Private and Blue Business Fleet customers who have not reach 105,000km/7 years only at participating Dealers. State Auto Club Roadside Assistance & Membership is included for 12 months or until your next eligible standard service (whichever occurs first). Customers must comply with scheduled servicing intervals to maintain continuity of membership. See www.ford.com.au/service/t-and-c for full terms.